320 Commonwealth is located on the south side of Commonwealth, between Hereford and Massachusetts Avenue, with 318 Commonwealth to the east and 322 Commonwealth to the west. 320 Commonwealth was designed by architect Samuel D. Kelley and built in 1881-1882 by Antoine Xavier and William Welch, builders, for building contractor John W. Shapleigh, one of two contiguous houses (318-320 Commonwealth) in the same design built for speculative sale. He is shown as the owner on the original building permit application for the two houses (one application for both houses), dated September 6, 1881. John Shapleigh purchased the 48 foot wide parcel for 318-320 Commonwealth on March 21, 1881, from Frank N. Thayer and William H. Lincoln. The parcel was composed of two lots, a 13.41 foot lot to the west that Frank Thayer and William Lincoln had purchased on October 23, 1879, from John Worster (the northeastern portion of an irregularly shaped lot with a 44.75 foot frontage on Commonwealth), and a 34.59 foot lot to the east (the western part of a 62.25 foot lot they had purchased on April 1, 1879, from Caleb H. Warner and Charles F. Smith, trustees for the benefit of the creditors of Nathan Matthews). All of the land was part of a larger tract of land Nathan Matthews had purchased on January 2, 1871, from David Sears, Jr., Frederick R. Sears, and Knyvet Sears. Caleb Warner and Charles Smith also owned the land on Newbury from the northwest corner of Newbury and Hereford running west 90.25 feet. In their deed selling the 62.25 foot parcel to Frank Thayer and William Lincoln, they included language specifying that only dwelling houses facing Hereford could be built on the land they retained on Newbury. John Worster owned the land on Newbury to the west of the land owned by Caleb Warner and Charles Smith, and in his deed selling the 13.41 foot lot to Frank Thayer and William Lincoln, he included language specifying that, for a period of ten years, no stable would be built on his land on Newbury without the consent of the owners of the land he was selling on Commonwealth. 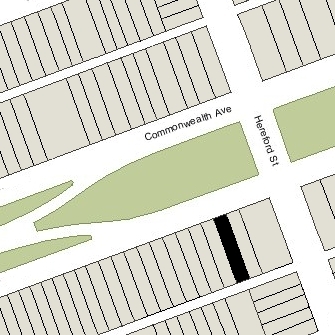 Click here for an index to the deeds for 320 Commonwealth, and click here for further information on the land on the south side of Commonwealth between Hereford and Massachusetts Avenue. On July 7, 1883, 320 Commonwealth was purchased from John Shapleigh by Adelaide (Larrabee) Taft, the wife of Edward Augustus Taft. They previously had lived at 29 Chestnut. Edward Taft was owner of the New York and Boston Despatch Express Company. They continued to live there during the 1895-1896 winter season, but thereafter made their primary residence in Bourne. They continued to own 320 Commonwealth and lease it to others. By the 1896-1897 winter season, 320 Commonwealth was the home of Joseph W. Merrill. He was a retired wool merchant from Exeter, New Hampshire, where his wife, Louise Clement (Lane) Merrill, had died in March of 1895. Their five children lived with him: William E. Merrill, Mary L. Merrill, Susan E. Merrill, Jeremiah H. Merrill, and Josephine F. Merrill. They continued to live at 320 Commonwealth until mid-1900, when they moved to the Hotel Vendôme. By the 1900-1901 winter season, 320 Commonwealth once again was the residence of Edward and Adelaide Taft. They continued to live there in 1903. During the 1903-1904 winter season, the Tafts were living elsewhere and 320 Commonwealth was the home of Philip Shelton Sears and his wife Mary Cabot (Higginson) Sears. He was a lawyer and trustee, and later would become a noted sculptor. They previously had lived at 4 Gloucester. By the next season, they had moved to 184 Marlborough. 320 Commonwealth was not listed in the 1905 Blue Book. On December 26, 1904, 320 Commonwealth was purchased from Adelaide Taft by Helen Taylor (Delano) Howland, the wife of Joseph Francis Howland. The Tafts moved soon thereafter to New York City. Joseph and Helen Howland made 320 Commonwealth their home. They previously had lived in Dorchester. They also maintained a home in South Paris, Maine. J. Frank Howland was former president of the Walter Baker chocolate manufacturing company. On July 5, 1905, Helen Howland transferred the property into her name for her lifetime, specifying that after her death, it would be in the name of her husband. J. Francis Howland died in July of 1914. Helen Howland continued to live at 320 Commonwealth until her death in May of 1915. Under the terms of her 1905 deed, 320 Commonwealth became the property of J. Francis Howland’s estate. On May 29, 1915, 320 Commonwealth was purchased from his estate by Adalyn (Henderson) Sanborn, the wife of Dr. George Phippen Sanborn. He was a physician and also maintained his medical office there. They previously had lived in Brookline and he had maintained his office 366 Commonwealth. 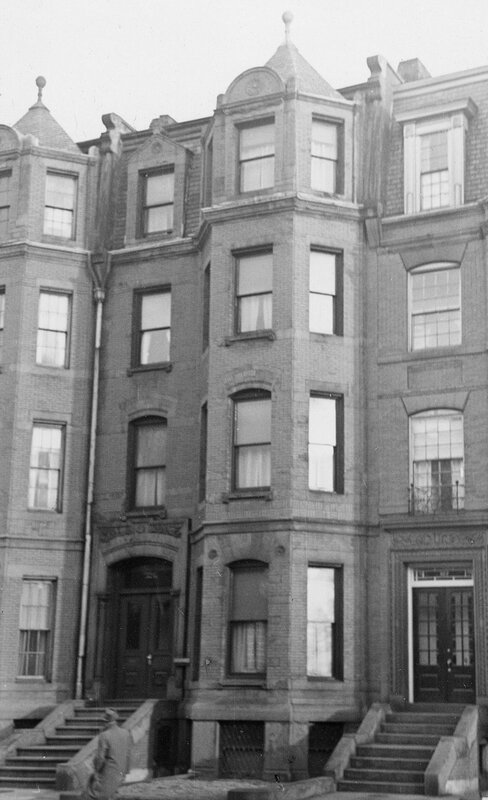 In about 1930, he moved his office to 412 Beacon, and by 1931 they were living in Cambridge. They continued to own 320 Commonwealth and lease it to others. By 1931, 320 Commonwealth was the home of Mrs. Lula M. (Fox) Darling, the former wife of Jerome M. Darling, who operated it as a lodging house. She previously had lived at 337 Commonwealth, where she also had operated a lodging house. In December of 1931, the Building Department cited Adalyn Sanborn for failing to provide sufficient egress. It appears she failed to remedy the violation, and she was reminded of the requirement by a letter dated February 1, 1932. Mrs. Darling continued to live at 320 Commonwealth in 1933, but had moved to 387 Commonwealth by 1934. By 1934, the Sanborns had resumed living at 320 Commonwealth and he had also moved his medical offices back there. Dr. Edward R. Williams also maintained his offices there; he and his wife, Helen Louise (Lutz) Williams, lived in Cambridge. The Sanborns continued to live at 320 Commonwealth (and he continued to maintain his medical offices there) until about 1940, when they moved to an apartment at 384 Commonwealth. On April 24, 1940, 320 Commonwealth was purchased from Adalyn Sanborn by Alice J. Sawyer, the widow of Frederick W. Sawyer. 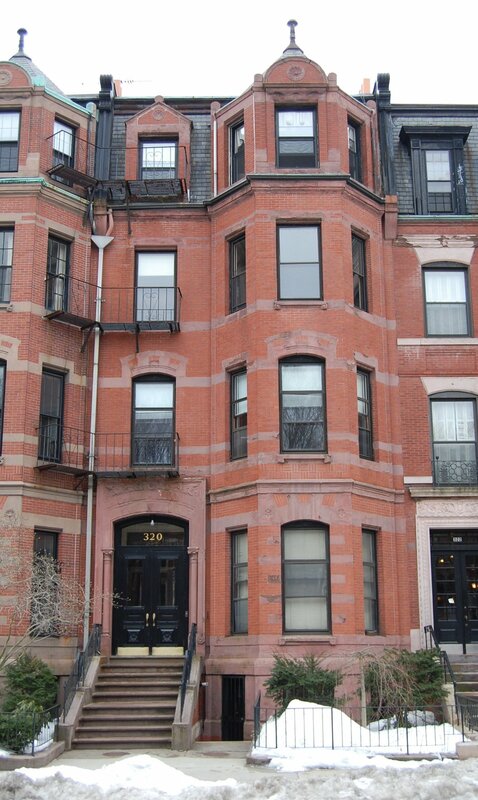 She previously had lived at 230 Newbury. In June of 1940, Alice Sawyer applied for (and subsequently received) permission to convert 320 Commonwealth from a single-family dwelling into a lodging house. She continued to live there until about 1957. She continued to own the property, which remained a lodging house. On August 2, 1961, 320 Commonwealth was purchased from Alice Sawyer’s guardians (her nephew, Eastman Tuttle, and her niece, Barbara (Tuttle) Curtin, the wife of Lloyd Curtin, both children of Morris Henry Tuttle and Buelah Mae (Eastman) Tuttle) by real estate dealer Charles Talanian and his wife, Nevart (Semonian) Talanian. That same month, he applied for (and subsequently received) permission to convert the property from a lodging house into ten apartments. On December 31, 1979, the Talanians transferred the property to their partnership, Chatal Associates LP, and on February 20, 1980, Chatal Associates transferred it to Charles Talanian as trustee of the Midtown Conversions Trust. 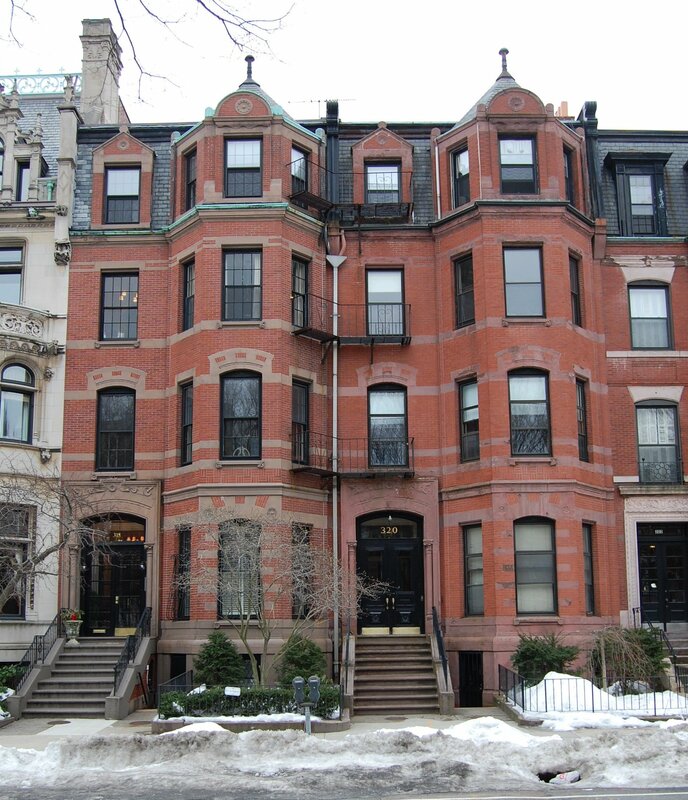 On June 16, 1981, Charles Talanian converted the property into ten condominium units, the 320 Commonwealth Avenue Condominium.